At EVMC we know that a new career can be the key to transform your life. We are here to guide you along that process, especially when it comes to assisting you in finding ways to meet your educational expense. Students are taught how to properly organize and create a professional resume for their particular chosen field. Student resumes will be reviewed and revised by multiple staff members resulting in a bullet proof resume, one that you will feel confident using to find your career. Interview skills can be just as important as the skills you learn in the classroom. First impressions mean everything and can impact you getting your dream job; from your professional appearance to your body language to how you present yourself. At EVMC you will be surrounded by a team that is devoted to preparing you for interviews. From offering resources for professional interview clothing, to complimentary hair services to mock interviews, EVMC is dedicated to your success. At East Valley Medical College we do not consider it a success until you have graduated AND obtained a position in the field of your choosing. Our entire staff is dedicated to working with each student to help prepare them to find the right job that fits both their schedule and their needs. Upon graduation you will be paired up with the career services department that will work with you in helping you find your career. Any time you need assistance with your job search, from helping set up interviews, to providing a list of current job positions, EVMC is dedicated to your success. Staff will assist graduates who choose to take the National Exam with their paperwork and registration as well as provide study material for various exams. Students have the option to take the National Healthcare Association (NHA) exam on campus, or choose from a variety of other exams. East Valley Medical College is a unique educational institute in that only 15 students per program are enrolled into each new class. This allows for one on one or group tutoring, individualized instruction and demonstrations in lab, and small classes that promote learning and success. As a result, East Valley Medical College graduation rates continues to set the bar high. EVMC believes that every student has the ability to be successful and we are honored to be a part of their success. We can't wait to help you get started here at EVMC. Contact us and let us know how we can help. 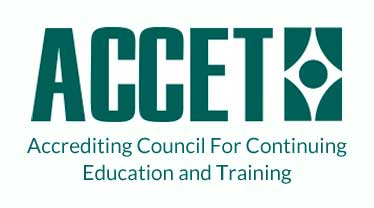 East Valley Medical College is nationally accredited by ACCET.